In May 2006, a delegation led by agriculture minister Sharad Pawar went to Israel to attend the 16th International Agriculture Exhibition. Rajasthan chief minister Vasundhara Raje was part of the delegation that went to visit world famous Kibbutz, a community cluster, in the Negev desert of southern Israel. She was, clearly, bowled over by the lush olive trees in the arid landscape. Olive is a small tree of the oleaceae family and is native to the coastal areas of eastern Mediterranean (Italy and Spain), northern Iraq and northern Iran south of the Caspian Sea. Its fruit adorns salads, but is used primarily to extract olive oil, one of the most expensive cooking oils. On her return, Raje decided to replicate the programme in her desert state and went about it with single-minded determination. She was undeterred by the fact that olive is alien to this country and is unlikely to show the results she had seen in the high-tech agriculture of Israel. She approached the Indian Council for Agricultural Research, but was rebuffed. Reason: a similar experiment was tried at Himachal Pradesh in 1985 and had failed miserably. But Raje persisted. Within six months of her visit to Isreal, a tripartite agreement was signed between Israeli company Indolive Limited, Rajasthan State Agricultural Marketing Board (RSAMB) and Pune-based Plastro Plasson Industries India, now known as Finolex Plasson Industries (India) Ltd, to set up a joint venture. 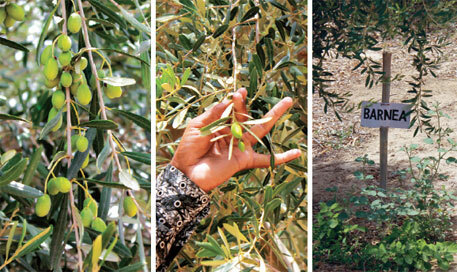 The result was the Rajasthan Olive Cultivation Limited (ROCL), which was formed in April 2007. As per the agreement, Indolive provided the expertise, Finolex the micro-irrigation solutions and equipment, and the Rajasthan government land and funds. RSAMB and Finolex invested Rs 1.50 crore each. About 112,000 olive plants of seven varieties were brought from Israel. Their rooted cuttings were hardened at a high-tech nursery set up especially for the project in Durgapura, near Jaipur. After the cuttings grew into small plants, they were transplanted in agriculture training centres (ATCs) at Sriganganagar, Nagaur, Bikaner, Jalore, Jhunjhunu, Alwar and Jaipur districts. The trees started bearing flowers and fruits in 2012, a year or two after they should have done so. Of the seven varieties planted on 182 hectare (ha), only three have yielded fruits, that too very little. The total production was only 10 tonnes and the oil yield was a mere 9-14 per cent of the olive production. This is what three-year-old trees yield the world over. Yogesh Verma, manager of ROCL, claims the experiment is a success. “Lab tests show that oil content in our olives is between 10 and 14 per cent, which is good. Our focus now is on improving the yield and bringing it to international standards,” he says. The state government’s ultimate aim is to get farmers buy these plants for their own plantations and earn profits. To achieve this, it has established a world-class nursery at Bassi, in Jaipur, which can produce one million plants in a year. It is also setting up an olive extraction plant at the cost of Rs 5 crore at Lunkaransar in Bikaner. The state government has diverted 182 ha, earlier used by ATCs for research and seed production, for a horticulture crop which is still a pie in the sky. The Lunkaransar ATC, for instance, has 75 ha. Of this, 30 ha has been diverted for olive. ACT officials say seed production earlier fetched around Rs 25,000 per hectare, amounting to Rs 7-8 lakh per season for 30 ha. “Revenue has dried up completely,” says a scientist working in an ATC who did not wish to be named. A senior scientist told Down To Earth that most ATCs had resisted the experiment but gave in because it was a government decision. “Olive is a horticulture crop with a long gestation period. Diverting such a huge chunk of land to an unknown crop is risky,” he says. The vegetative growth in these orchards has reached 80 per cent, but reproductive growth is still zero, he adds. Besides, importing these exotic species involves risks, says ecologist Debal Deb of West Bengal-based organisaton Centre for Interdiscipli- nary Studies. Olive’s success will be at the cost of local flora, including khejari (Prosopis cineraria), a keystone species in the state, says Deb. Dense olive monoculture can alter the local ecosystem and habitat through loss of native biodiversity. Native seeds present in the soil will eventually get depleted and limit the ability of native plant communities to regenerate even if olive is removed later. Olive trees are known to be an invasive species in Australia and Tasmania. In south Australia, all types of olive, including the African and European subspecies, are listed as a Class 5d weed under the South Australia Natural Resources Management Act 2004. A number of measures have been put in place in Tasmania to prevent the spread of the species, including creating an olive register, establishing a code of practice, risk assessment, and educating both commercial growers and home gardeners. Olive seedlings are known to escape from orchards due to the large amount of bird-dispersed seeds, potentially resulting in the formation of dense monocultures, which can permanently displace native plant species. Cercosporiosis is a common and widely distributed disease in most olive growing countries—Algeria, Argentina, Australia, Brazil, Chile, China, Germany, Greece, India, Italy, Montenegro, Netherlands, New Zealand, Portugal, Spain, Tanzania, Tunisia, the US and the former Yugoslavia. However, this disease was first reported in UK in 2009. “Rajasthan may experience a new disease agent whose impact on local biodiversity and agriculture cannot be foretold,” says a senior entomologists in the state agriculture department on the condition of anonymity. “If any new pest or pathogen erupts and attacks any other native plant species, the impact will not be confined to Rajasthan because insects and fungi can spread across long distances in very short time. There are numerous instances of exotic crop pests or pathogens spelling disaster for a country’s agriculture and forest ecosystems,” says Deb. When the project was started in Rajasthan, agricultural scientists from the state government or the state agriculture university were not involved, says the entomologist. “Israeli experts were blindly followed without thinking of its implications on local agriculture and biodiversity,” he says. But Verma of ROCL dispels all fears of invasion by the foreign olive species. “The plants were imported through the Department of Plant Protection, Quarantine and Storage. They were free of all pests and diseases,” he says. Notably, olive trees require a considerable supply of water to produce good quantity of fruits. This implies that irrigation for the orchards will tax heavily the local stock of water, whether tapped from rivers and ponds, or from the subsurface water table. In its obsession for olive, the state government has overlooked the ecological disaster for the local population in the near future. Despite the threats, the state government has decided to expand the project. In the next three years, it aims to spread olive to farmers’ fields over 5,000 ha. Farmers get 75 per cent subsidy on plants, 90 per cent subsidy on drip irrigation and Rs 3,000 per ha for fertilisers and chemicals. Besides, they get technical support of one expert per 50 ha. At present, Rajasthan farmers get one olive plant for Rs 115, while farmers from other states buy it at the cost of Rs 150. Peleg admits that farmers in Rajasthan are different from their Israeli counterparts who use advanced technology and are prosperous. 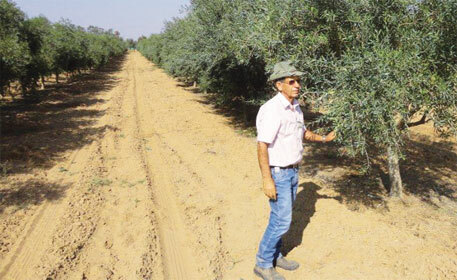 The economic returns of olive come after a few years of plantation, “so either the government should provide farmers with monetary help or farmers should find a way to sustain themselves for this initial orchard investment period,” he says. While the state government is confident that farmers will get a good price, the question is how sustainable olives are in Rajasthan’s climate and agrarian economy. Q: You had a well established agri-business in Israel, so why did you start a project in Rajasthan? A: I have 50 years of experience of growing horticulture crops in deserts. I was looking for a change and a challenging environment. At that time, I got the offer to work in Rajasthan for Indolive, and I landed here. Q: Is Rajasthan similar to Israel? A: When the then Rajasthan chief minister Vasundhara Raje visited Israel, she touched and felt the soil of Negev desert. She was confident that the weather conditions were similar to her state and wanted a replication. But the conditions are not very similar. Rajasthan has extremely high temperatures, monsoons are for long durations and winters are chilly. It is not so in Israel. The salinity of water is also high compared to Israel. Q: How did the olive plants imported from Israel adapt to local environment? A: The plants were imported in the form of rooted cuttings. I developed a nursery in six to eight months, which I consider a feat. Then the plants were transplanted to seven different agro-climatic regions of Rajasthan to test and select the best ones. The varieties were selected by Indolive. Q: People are sceptic about the project’s success. A: The investors were expecting quick returns, which was a big mistake. When a horticulture crop is shifted from one continent to another, it takes time to adapt to the new environment. The growth rate of fruit crops can be delayed by a few years. When transplantation was done to establish orchards, scientists declared it a failure. Then when plants grew to a substantially good height, they raised doubts over flowering and fruiting. Now that these have been achieved, the new question is yield. Scientists are not confident about the project because earlier such projects in Himachal Pradesh and Jammu & Kashmir have failed. But that was because of lack of expertise, which is not there in the Rajasthan project. Everything takes time and this will, too. I’m confident with this year’s production that the project is a success. Q: What are the challenges of growing olives in Rajasthan? A: It takes five to six years for olive trees to start bearing fruits. This means no income for those years. Second, inter-cropping with olive is also difficult. Olive needs regular water supply. 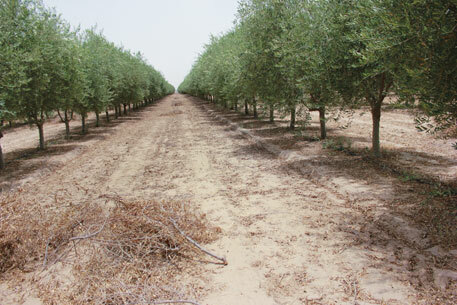 The climate of Rajasthan is similar to Southern Europe like Greece and Spain, hence Olive can be viable. It is wrongly stated that it needs a lot more water than is available. Olive demand is rising rapidly in India and all of it is imported. As it is the most costly cooking oil, the prices of the produce are good and it does not mean it is making losses. Farmers in Rajasthan will find it as good diversification from traditional crops. I am reminded of Jatropha hype in India. It has ended up as HIGH PROMISE AND LOW(NO) PERFORMANCE? Unfortunately in India Farming is undertaken by most of the Non farmers since they have money. They don't have long term goal and sustained plan.In Andhra Pradesh some time back there was humming activity in Aqua Culture. Now it is minimal. I have seen in Denmark most of the agriculture is by Agricultural Graduates. It is intensive farming with innovative practices. The same in Israel.In the land allotment for projects like Jatropha farming ,politics and money played dominant role. Genuine farmers who want to undertake the cultivation are left out. In farming local ingenuity and farmers experience play a major role. Farmers have to be included in decision making by the Government in drawing plans related to agriculture. There many options to have get rich oil from our own soil.Think and see the tree Madhuca indica thousands of tribals of country seviving on this tree as if landholders elsewhere. unfortunately we see towards somebodys plate and justify big laddu there in and try to grab it. Similar case with oilpalm plantation being promoted in India it is sure it will another fraud of politician and so called experts. I think olive is more suitable for anantapur district I am not sure about that but I think so. Interested in olive farming details in Rajasthan.I will be if I can get details for the contact person. pls contact rajasthan olive cultivation limited. Sir, I belong to Haridwar, Uttarakhand. I want to plant tree of olive for oil in Haridwar. Please send details for commercial farming, thanks. Excellent article!! I am very pleased to get a good understanding of the Rajasthan projects through this article. I am very curious to see if the yield has become economical now in Rajasthan. This would be a crucial aspect for investors such as me. I do not have a problem with delay of 5 years for ROI but I do have a problem with lack of yield. Some summary on this would be much appreciated. A negative article, that's what our problem.